was his range of interest. Yet almost everything he wrote was in response to specific problem or an actual crisis in the immediate situation. One may mark off significant developments in his thought over this twoscore years, but one can hardly miss the fundamental consistency in his entire life's work. He was never interested in writing a systematic summa theologica, and would have been incapable of producing a balanced digest of his multifaceted teaching. Thus, if he is to be read wisely, he must be read widely--and always in context, with due attention to the specific aim in view in each particular treatise. 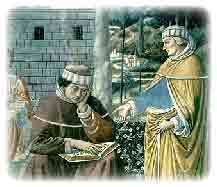 For the general reader who wishes to approach Augustine as directly as possible, however, it is a useful and fortunate thing that at the very beginning of his Christian ministry and then again at the very climax of it, Augustine set himself to focus his experience and thought into what were, for him, summings up. The result of the first effort is the Confessions, which is his most familiar and widely read work. The second is in the Enchiridion, written more than twenty years later. In the Confessions, he stands on the threshold of his career in the Church. In the Enchiridion, he stands forth as triumphant champion of orthodox Christianity. In these two works--the nearest equivalent to summation in the whole of the Augustinian corpus--we can find all his essential themes and can sample the characteristic flavor of his thought. lust, and adolescent mischief. The memory of stealing some pears prompts a deep probing of the motives and aims of sinful acts. "I became to myself a wasteland." Cicero's Hortensius, the enkindling of his philosophical interest, his infatuation with the Manichean heresy, and his mother's dream which foretold his eventual return to the true faith and to God. continues his fruitless search for truth. disenchantment with the Manichean conceptions of God and evil and the dawning understanding of God's incorruptibility. But his thought is still bound by his materialistic notions of reality. He rejects astrology and turns to the stud of Neoplatonism. There follows an analysis of the differences between Platonism and Christianity and a remarkable account of his appropriation of Plotinian wisdom and his experience of a Plotinian ecstasy. From this, he comes finally to the diligent study of the Bible, especially the writings of the apostle Paul. His pilgrimage is drawing toward its goal, as he begins to know Jesus Christ and to be drawn to him in hesitant faith. from his professorship and of the days at Cassiciacum in preparation for baptism. He is baptized together with Adeodatus and Alypius. Shortly thereafter, they start back for Africa. Augustine recalls the ecstasy he and his mother shared in Ostia and then reports her death and burial and his grief. The book closes with a moving prayer for the souls of Monica, Patricius, and all his fellow citizens of the heavenly Jerusalem. memories of the past to the inner mysteries of memory itself. In doing so, he reviews his motives for these written "confessions," and seeks to chart the path by which men come to God. But this brings him into the intricate analysis of memory and its relation to the self and its powers. This done, he explores the meaning and mode of true prayer. In conclusion, he undertakes a detailed analysis of appetite and the temptations to which the flesh and the soul are heirs, and comes finally to see how necessary and right it was for the Mediator between God and man to have been the God-Man. together his memory of his past life, his present experience, and his ardent desire to comprehend the mystery of creation. This leads him to the questions of the mode and time of creation. He ponders the mode of creation and shows that it was de nihilo and involved no alteration in the being of God. He then considers the question of the beginning of the world and time and shows that time and creation are cotemporal. But what is time? To this Augustine devotes a brilliant analysis of the subjectivity of time and the relation of all temporal process to the abiding eternity of God. From this, he prepares to turn to a detailed interpretation of Gen. 1:1, 2.
interpretation of Gen. 1:1, 2, is not self-evidently the only possibility, Augustine turns to an elaborate discussion of the multiplicity of perspectives in hermeneutics and, in the course of this, reviews the various possibilities of true interpretation of his Scripture text. He emphasizes the importance of tolerance where there are plural options, and confidence where basic Christian faith is concerned. The four books of Augustine On Christian Doctrine (De Doctrina Christiana, iv libri) are a commend of exegetical theology to guide the reader in the understanding and interpretation of the Sacred Scriptures, according to the analogy of faith.